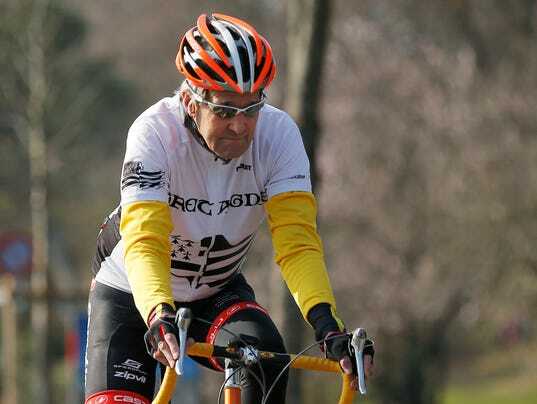 Secretary of State John Kerry is heading to Boston for treatment of a broken right leg, an injury he sustained Sunday in a fall after hitting a curb while cycling part of the Tour de France route in eastern France. The injury forced Kerry to break off a four-nation trip that included an international conference on combating the Islamic State, and the injury raised questions about his ability to participate in future diplomatic initiatives. State Department spokesman John Kirby said Kerry will be treated at Massachusetts General Hospital by the same physician who operated on his right hip in 2009 to relieve chronic pain. He said X-rays confirmed that Kerry fractured his right femur (thigh bone). “The secretary is stable and never lost consciousness, his injury is not life-threatening and he is expected to make a full recovery,” Kirby said. Kerry fell near the town of Scionzier, southeast of the Swiss border. He was airlifted to a hospital in Geneva. He’s flying back to the U.S. on a plane with special medical equipment, the State Department said. It’s unclear whether Kerry needs surgery, or how a lengthy rehabilitation might affect nuclear talks with Iran. Kerry has been the lead negotiator in several sessions with Iran over the past two years. He had been in Geneva for a Saturday meeting with Iranian Foreign Minister Mohammad Javad Zarif. The sides in the negotiations have been working toward a June 30 deadline for a comprehensive nuclear accord between Iran, the U.S., France, Britain, Germany, Russia and China. Kirby said Kerry will participate remotely in Monday’s conference in Paris on the Islamic State threat. Kerry, 71, is an avid cyclist and often brings his bike on diplomatic missions. He took bike trips during breaks in talks earlier this year with Iran and the other nations. It’s not his first athletic scrape. In 2012, he appeared at the State of the Union address with black eyes and a broken nose — the result of a collision in a pickup ice hockey game.